Make your family getaway a whole lot of fun- book an Indies Hotel stay. Our 15-room Jamaican style resort in one of the Island’s most scenic areas is so family-focused that our guests swear they don’t miss our great amenities. Make your next family vacation the best ever! We’ve got scrupulously clean & beautiful rooms with a garden patio view. Fitted with contemporary furnishings and air-conditioned rooms come with a cable television, telephone and safe box facilities. Rooms include a private bathroom offering hot & cold shower and free toiletries. Stay in touch with your loved one while you are “Home away from Home” with our free Wi-Fi facility. We have introduced a bit of English in the Caribbean. People love English style food, which is why we serve English style fish and chips in our resort. 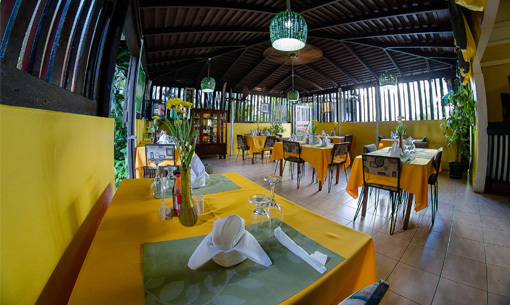 You can also enjoy the best Jamaican cuisine even without having to go out! Whatever dish you order, we assure you only high-quality & fresh ingredients go into each dish. When it comes to Indies Pizza, our restaurant is very popular for it. It has a true Jamaican flavour- hot & spicy, leaving you wanting for more! What’s more? Have a great evening at our bar! 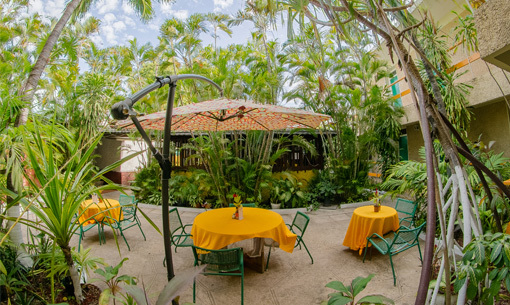 Dine in our Restaurant, or on our Garden Patio. Room Service is also available. We are open from 7 am to 10 pm for Breakfast, Lunch & Dinner. Your big day is our #1 priority. We believe every wedding should be as special as you are which is why you can embark on the exciting journey of planning your perfect wedding with us. If you are looking for an outdoor wedding, then book Indies Hotel as your wedding venue. Forget about most of the time-consuming wedding arrangements. From decoration to flower arrangement, table setting, and food, we ensure your peace of mind by perfectly organising everything from start to finish. Our Garden Patio hosts thirty (30) to forty (40) guests. 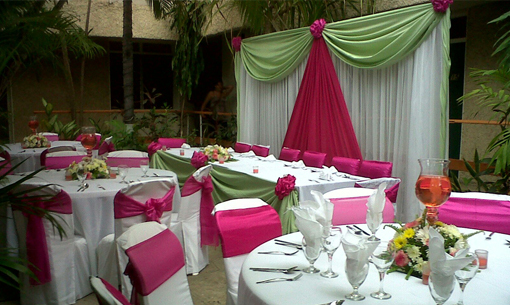 We are famous for not only our garden weddings but small functions, meetings and other gatherings. Let us be your perfect host! Our resort is located in the heart of New Kingston, so you don’t have to travel much for being on the best places of the Island. This is why our guests love us! From Fort Clarence Beach to the Bob Marley Museum, the Emancipation Park, major districts & more, everything is nearby for your ultimate day trip!